Directions: Upper East Fork From Meyers, at junction of Highways 50-89, take Hwy 89 South for 11 miles to junction of Highways 88-89. Turn East and go 6 miles to Woodfords. Turn South and go 12 miles on Highway 89 (past Markleeville) to junction with Highway 4. Continue straight on Hwy 4 for 3 miles to Wolf Creek Road. Turn Left (dirt road crosses Silver Creek bridge) and go 2.5 miles to mouth of Wolf Creek. Hike upstream from here. Other access trails from Wolf Creek and Silver King Creek drainages. Heenan Lake, At junctionof Highway 89 and 4, Turn East and continue on Hwy 89 toward Monitor Pass. Go 4 miles up steep hill and turn right at Heenan Wildlife Area to parking lot. 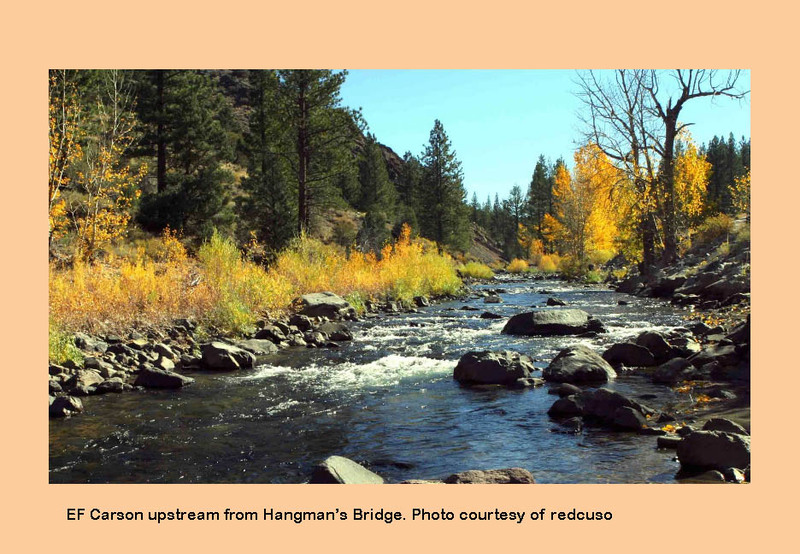 From Hangman's Bridge to Silver Creek, the river is planted with large rainbows and Lahontan Cutthroats. It has a limit of 5 fish with the season from the last Saturday of April to Nov. 15th. 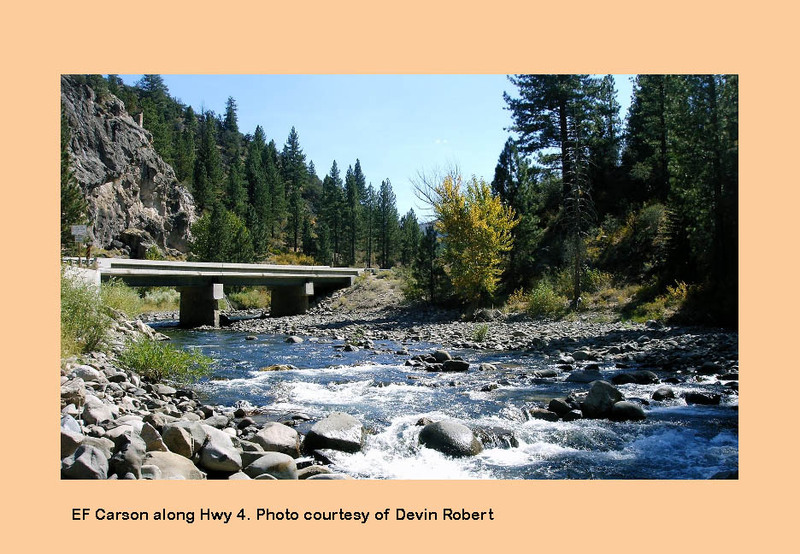 Trout plants are weekly by both Alpine County Fish and Game Commission and the CDWF. About 15,000 lbs. 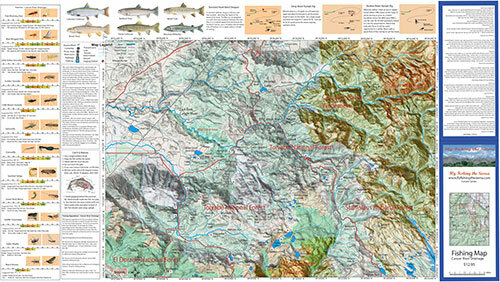 of trout are planted by Alpine County and another 100,000 lbs by the CDFW. Planting schedules are discontinued once the flows are too slow or the water temperatures become too warm. There are wild trout also but the area gets considerable habitat pressure from the hatchery trout. Most of this water contains pools and riffles. Above the confluence of Wolf Creek, the river once again is a designated Wild Trout fishery of rainbows, browns, and brookies. Many of these fish are in the 8-12 inch class. The general fishing regulations of a 5 fish limit still apply. A trailhead, the Carson River Trail, starts off Wolf Creek Road where the East Fork merges with Wolf Creek. This trail will take you to either the Silver King Creek fork or along the East Fork of the Carson. 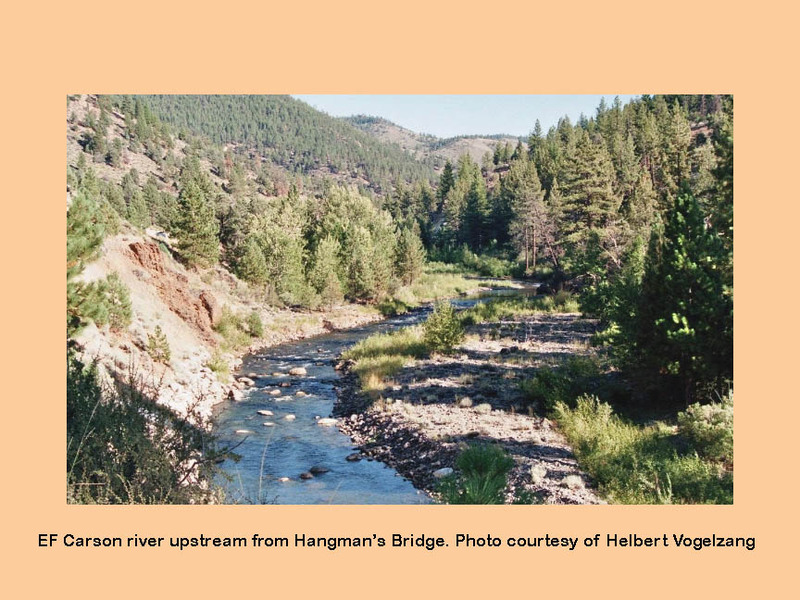 The river is canyon water from Hangman's Bridge to Wolf Creek with large plunge pools. At the junction of Wolf Creek, the river becomes a pool and riffle stream until the trail reaches Gray's Crossing. Early in the season, subsurface patterns such as Golden Stonefly Nymphs with a Prince Nymph dropper work well. Try the edges and slow water as the colder water tends to limit the trouts movement. The Spring Hatches generally start in June, so prior to the hatch try Streamer patterns such as Buggers and Matukus. Use a type II Sinking line and cast across the stream to allow a downward drift and swing. Let the streamer pause at the end of the swing before retrieving. Retrieve with some sporadic pulls. In June, when the water warms up a bit, the salmonflies become active and a Clark's Stonefly or Stimulator size #6-8 works well. Fish these salmonflies in the moderately fast water particularly near bank vegetation. June is also a good month for Green Drake nymphs (Green Drake Poxyback, Black A.P. , Prince Nymph) with a caddis pupa dropper. You will also encounter a Green Drake spinner fall in the evening. PMD's will show up around midday and the late afternoon brings on a flight of Yellow Sallies. Another combination that works well here is a dropper from a Chernobyl Ant. Caddis patterns work well throughout the season, especailly during the evening, as caddis flies are quite prolific. The most common colorations are yellow to tan. A yellow Elk Hair Caddis pattern in size 12-16 is a good pick. Some Brown Sedge and slate sledge caddis emerge in late spring to mid-July.Try using a Goddard Caddis #14-16 to match this fly. As an Attractor Dry, the Royal Wulff #14-16 is the most popular on the river. A good October Caddis hatch occurs for excellent dry fly opportunities. Nymphing works well with Hare's Ear Nymphs in sizes 8-14 or Zug Bugs in size 8-10. Heenan Lake: (Click the above map on Heenan Lake). 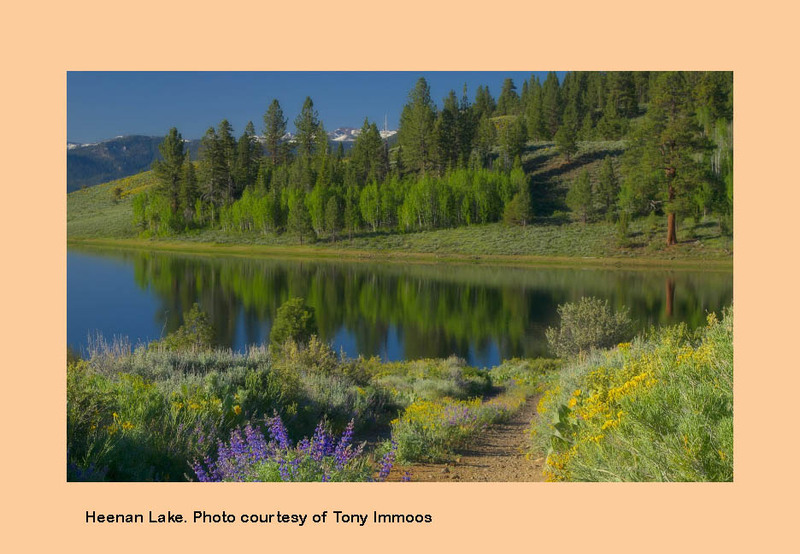 The 135 acre Heenan Lake has been renowned for producing huge Lahonton Cutthroats up to 30" with the average being 16 to 20". The Department of Fish and Game have a station there that take some spawners from the lake for egg collections. These eggs are distributed to a number of other state hatcheries including the Hot Creek Hatchery and Nevada Dept of Wildlife. The hatchlings are restocked into Heenan and over 30 additional Eastern Sierra lakes. The Heenan Lake Lahontons are actually a hybridized strain of the original Lahonton Cutthroats that inhabited Lake Lahonton in prehistoric days. The regulations to Heenan Lake is a strict catch and release on barbless hooks on flies or artificial lures. The season opens on the Friday before Labor Day and continues until the last Sunday of October. You can only fish Friday, Saturday, and Sunday. Monday through Thursday are not allowed. The tributaries to Heenan are also off-limit year round. Heenan is ideal for float tubing but has recieved heavy fishing pressure recently due to its reputation for big trout. Algea can be a big problem as well. Trolling streamer patterns of Woolly Buggers, Leeches and Matukus in Black, Purple, or Olive from a float tube has been the favored method to fish Heenan. No gas-powered craft are allowed. It's shallow so an intermediate sinking line is sufficient. Dark colored nymphs in sizes 12-14 such as Pheasant Tails, Bird's Nests, and Prince Nymphs with an indicator also work well. Use a slow retrieve. Recently, using a chironomid pattern has become quite popular when used as a dropper below the nymph from 2 to 6 feet in depth. Allow the rig to sit with an occasional twitch. Generally, an intermediate sinking line is the best bet with a 7-8 foot leader. The Lahontans do not put up as rigorous fight as a similar-sized Rainbow so a leader of 4x to 5X should suffice. Wolf Creek: This a a fast moving small stream with plenty of runs and riffles in the upper sections. Expect to find brookies in the upper regions and rainbows in the 8-11 inch class. 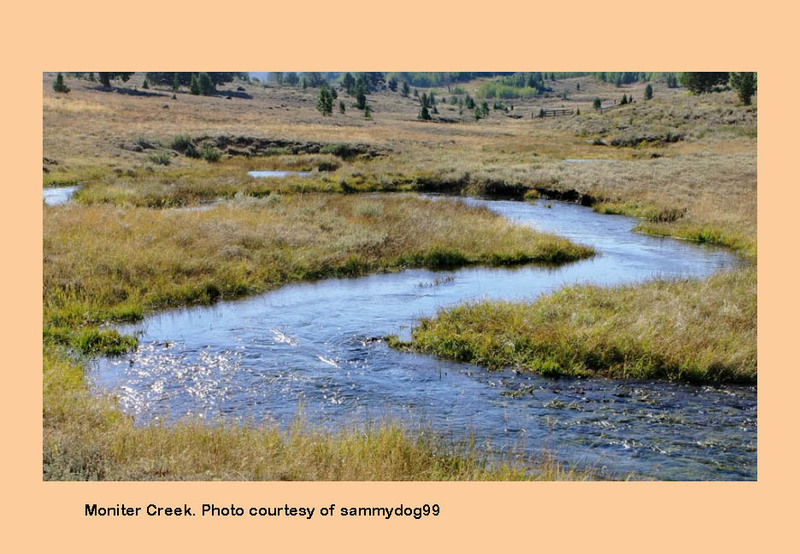 Wolf Creek then flows into a lower meadow which slows and flattens the stream out before entering a short, narrow canyon to reach the East Fork. This meadow section will have Browns in the undercuts about 9-12 inches. Silver Creek: The upper sections of Silver Creek contain wild rainbows 7-12 inches. It has numerous plunge pools and runs just below Silver Creek Campground. Above the campground, the flows tend to become quite small during the midsummer and do not sustain the trout populations. Further downstream, the number of planted rainbows will become more numerous as they get planted in many locations along Highway 4. 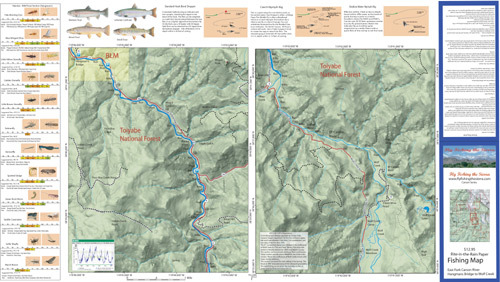 Covers the Carson River between Hangman's Bridge and the confluence to Wolf Creek.Topographic relief showing features surrounding the river. Shows camping areas, GPS Long./Lat., road access, trails, and property boundaries. Special Features are the Hatch Chart, Fishing Season and Regulations, Fish Identification, Historical Flow Chart, Nymphing Rigs, and Stream Etiquette guidelines. Printed on Rite-in-the-Rain Paper that will allow you to write those special notes. Waterproof and Durable.